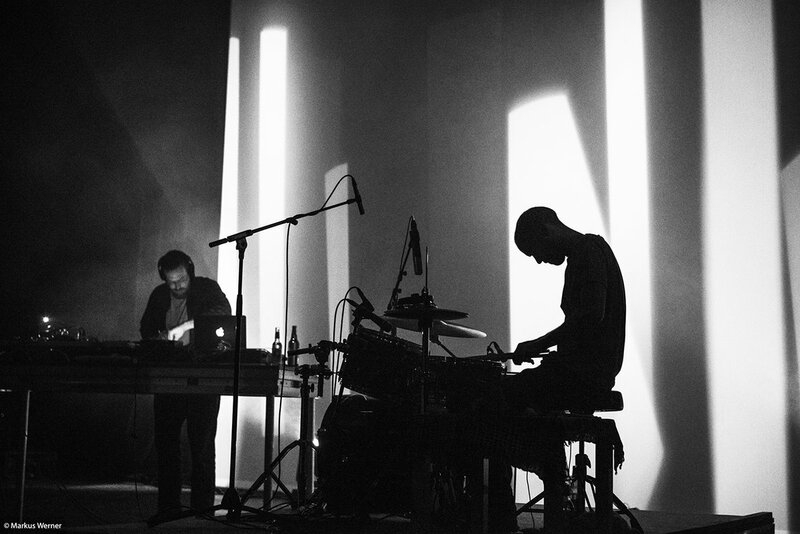 A large part of Hidden Orchestra's rise can be attributed to their phenomenal live show. A truly extra-sensory experience, it features two full drum kits, piano and violin from Poppy Ackroyd, bass and electronics from founder Joe Acheson, and immersive visuals from Tom Newell. Fresh from the release of their 'Dawn Chorus' and Dawn Chorus Remixes' albums, Hidden Orchestra are set to see out the year with another burst of headline European shows. Set to play London's newly refurbished Queen Elizabeth Hall - part of the historic Southbank Centre - the run contains a number of very special dates. Impossible to choose – maybe touring festivals in India with Flying Lotus and SBTRKT. Glossing over a European tour which ended prematurely with a nasty motorway crash in Serbia, maybe the same Indian trip – on which one of my drummers and I both broke our arms when swapping Bollywood dance moves with backstage crew, and then had to play another 14 shows in Europe one-handed with a lot of painkillers. Too many to choose from – lots of incredible festival sites from medieval coastal forts to abandoned industrial sites and stages overlooking forests and lakes, an old metro train factory in Kiev, a giant converted gas tank in Ostrava, a former abattoir in Luxembourg, a theatre in Cairo, a Soviet warship on the Danube in Budapest, the room from which the outbreak of World War Two was announced in central Moscow, mountaintop venues in Switzerland, clubs and venues of all shapes and sizes, plus dozens of beautiful concert halls, churches, museums and cinemas. I remember being surprised when playing for the first time in Prague and the sold-out crowd recognised tunes just from hearing the first few seconds. Memorable dishes include kantaifi (chopped walnuts wrapped in shoestring pastry, soaked with honey) with sheep's milk ice cream in Athens – and discovering avjar in Skopje (roasted red pepper sauce), which I've been making ever since. Exploring regional food cultures everywhere is one of the most interesting and exciting parts of touring – and even in a country like France you can have some of the best and the worst food of your life in a single day. Guilty pleasure would be a raspberry tartlet from a French service station. We once picked up a German hitchhiker who turned out to be a performance artist whose act included cutting his arms and soaking the blood up with sugar cubes. Noise-cancelling headphones. Whether in the bus, on a plane, wherever, it's the only way I can get some sleep while travelling.